Solomon was the wisest man on the earth and a deep thinker. Can I just say that I have to be in the mood for people like that? They can be a little exasperating. I’ll admit they have some really great things to say, in small measured doses. In his musings on the meaning of life, Solomon wrote about the value of a friend. Something about that triple-braided cord makes me think of Charlie’s Angels. When the Angels are out-numbers and over-powered, they stand back to back to back. We cannot defend ourselves from behind. We need people who have our back. And in order to have a friend like that, you have to BE a friend like that. We flourish in friendship during our teen years and our senior years. But there is a gap in the middle years of our lives where the majority of us are longing for relationship. 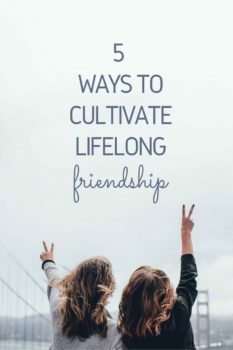 So here are 5 practical ways to cultivate life-long friendships. Be vulnerable – Friendships flourish when we take the risk of coming as we are. Not plastic. Not perfect. Just real. Be playful – Life doesn’t always have to be so serious. Do something whimsical with a friend. Go see a baseball game. Try a swing dancing lesson. Buy a Groupon for horseback riding. Invite a friend to do something remarkable that neither of you has done before. Be strategic – Choose a small group of friends to connect with. Go deep, not wide. Think about the layers of community in Jesus’ life. Sure there were thousands of people who were drawn to him. But he trained and mentored 72 followers. He spent his daily life with just 12 disciples. And there were only 3 people in his inner circle. Focus your limited time and energy on cultivating deep relationships within those smaller circles. Be an initiator – Research shows that the biggest difference between people who have friends and people who don’t is how cute they are. NO!!! That’s not true at all!! The biggest difference between people who have friends and people who don’t is their ability to initiate activities. Take some time today to think about the layers of community in your life. No pressure to come up with 72 today. Focus on the 12 folks you want to do life with and the 3 friends in your inner circle. Do I need to move past a relationship that is holding me back? Do I need to reengage with an old friend? Who do I need in my circle to help me become who I was meant to be? Make a plan to reach out and initiate an activity with a few friends this week and send a note to the people in your inner circle telling them how important their friendship is to you.